Setting Up a Development Environment shows viewers how to download and install the XAMPP program. This program contains an apache web server and is what we will be using for the rest of the lessons. After downloading and installing XAMPP, viewers will then download and install Sublime Text 2. Once viewers have both XAMPP and Sublime Text 2 installed, they will test their development environment by creating a sample HTML page. Traversing the Document Object Model (DOM) introduces viewers to how jQuery can be used to select various elements in the DOM. The video starts with a quick view of what the DOM is and how it is put together. Then it moves into how to use various selector filters to select the element we want. Viewers will then learn how to traverse the DOM tree to select various elements. Finally, the video looks at a few miscellaneous methods for tweaking the selection. Manipulating the DOM shows how to add and remove elements and data from the DOM. Viewers will learn different ways to wrap elements in new elements and how to insert elements into the DOM. After that, viewers will learn to remove, replace, and copy elements from the DOM. Modifying Attributes and Styles starts out by showing how to get and change the values of attributes. Viewers then learn how to add, remove, or change styles that have been applied to the page. This includes adding, removing, and toggling classes. After modifying classes, the video takes a look at changing the height and width. This continues with determining the offset of elements displayed on the page. To finish the lesson, the video shows how to use data attributes for data storage. Event Handling teaches viewers about listening, using, and attaching events. The video starts by showing how jQuery allows for attaching events on either page load or on the DOM ready event. Viewers then learn about some browser events such as scroll that can be used. It then shows how to use various mouse and keyboard events such as the click and keydown event. Finally, it shows developers how to apply their own event listeners and the difference between them. Animation and Effects teaches viewers about the powerful animation and effects methods that jQuery contains. It starts out with some simple effects such as the hide and show methods. It then moves into adding some flair by using fade and slide effects to make elements appear and disappear. Lastly, viewers will learn how to create their own animations and effects with the animate method as well as look at how queuing animations works. Server Communication through Ajax shows how to use Ajax to add content to a page. It starts by looking at how Ajax is used with jQuery and how the default settings can be changed. It then takes a look at various events that can be used for error handling and processing. It then covers some of the helper methods that help to handle data formatting for transfer. Lastly, viewers will learn about the shorthand Ajax methods that can be used to get remote data. 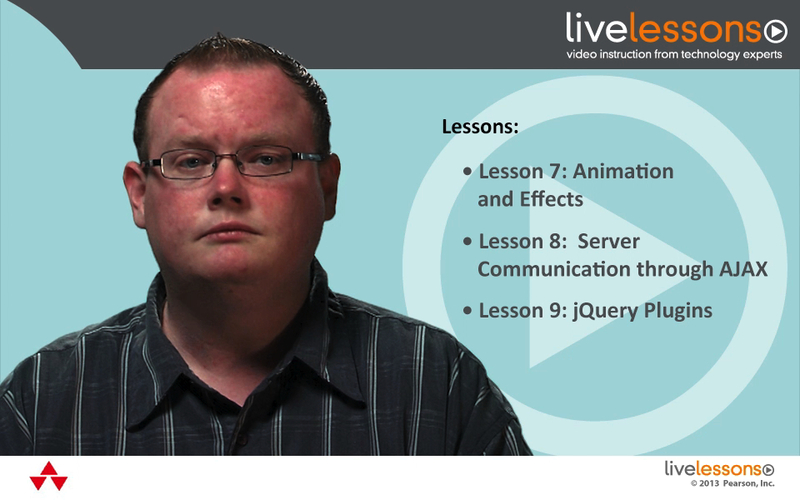 jQuery Fundamentals LiveLessons covers the core jQuery library. This library gives you an easy to use solution that will enhance the functionality and use of your website. Developer and author, Phil Dutson, focuses each lesson in jQuery Fundamentals on a particular portion of the jQuery library, and by the end viewers should be proficient in using jQuery, as well as writing their own plugins. Viewers will learn how to set up a development environment, including a web server, in both Windows and OS X; use a selector and refine the elements selected; move around the Document Object Model (DOM) tree to selected elements; manipulate the DOM; change attributes and styles; utilize Event handling; add animations and effects; load data remotely through various Ajax calls and actions; and finally, how to use jQuery plugins and how to create their own.